I Love You Because . . . » Archive » I Gave You Death . . . I Gave You Death . . . The morning that we went and took this picture I had just received an appreciative email about this project from a friend of a friend. She told me how brave it was to reveal so much of myself through the comments I write for each picture, and how inspiring that vulnerability is. I went back and read everything I’d written and I realized that, yes, I have been very frank and open about some of the things I struggle with. It wasn’t part of the original vision for the project but it has been a vital addition. It is my hope that in publicly examining my experience people may feel a greater connection to the work. I suppose this is all a roundabout way of saying that driving over the Bay Bridge that morning to create this picture I was in a contemplative mood. Stina wanted to express something for her son Titus that captured a little bit of how hard it is be a parent — to know that you cannot protect your child from everything. She knows that ultimately, her son will die, just like everyone else. But she also recognizes that death is what informs life, making it majestic, sweet, and beautiful. She told me how she carried her son around inside her, totally protected and cared for. But after birth children are suddenly exposed to all the dangers of the world. As a mother, that is a hard transition. In fact, that day, as Titus ran around amongst the gravestones, he fell and bruised his cheek. Luckily, he’s quite fearless and wailed for a moment and carried on. I can see how tiring, thrilling, tough, and wonderful it must be to have a child. 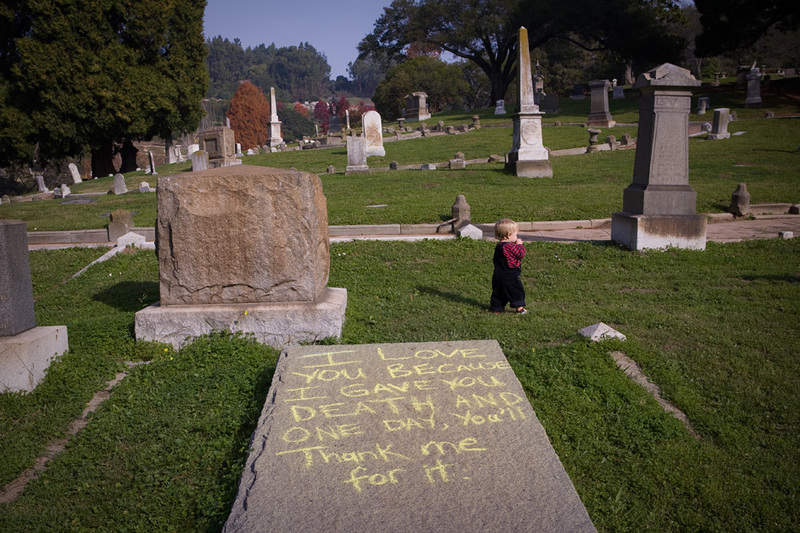 I do want kids of my own some day and I hope that, like Stina did that morning in the cemetery, I will allow my child to fall, get bruised, and get back up only to try again. Many years from now, making his own mistakes, Titus will cry. At some point, realizing a dream, Titus will holler for joy. One day, understanding the gift of mortal life, with all of its highs and lows, he will thank his mother. Click here to see a portrait of Stina.